WipQ - Simple and intuitive project management. Simple and intuitive lean and agile project management on Mac, for solo professionals and small teams. Kanban board style interface with Work In Progress (WIP) limits, with tags, priorities, custom properties, card tasks, locking and favourites. Customisable queues and folders for organising your work and workflow with kanban, Personal kanban or your own custom processes. Built with Swift and standard macOS app interfaces such as document model, versioning, drag and drop, copy/paste, undo/redo, printing, dark mode, continuity camera etc. 6 different card display themes to choose from. 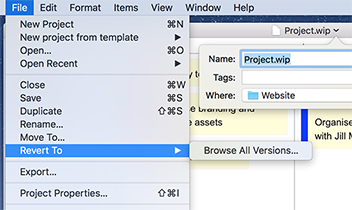 Saves project data locally to your Mac so you own it — so no third party storage, login, or ongoing fees. Exports all data as CSV, XML and JSON (in case you want to move to a different tool). Cards in WipQ are items of work. In agile projects these might be user stories or other project tasks, or even use cases or design documents. Cards can also have individual tasks required to complete the work, and can be tagged as having different types of work. You can have as many queues as you like, meaning cards can move through various states (queues) until they are completed. Got a unique workflow state in your project? No problem, just one click in WipQ will add another queue for it. Create as many work folders as you need, to manage individual phases of your projects. For example in an agile project, you might create a folder for each iteration, or for each sprint in Scrum. Work folders can be renamed, ordered and deleted. Cards can be dragged or cut/copy/pasted between folders as well as queues. 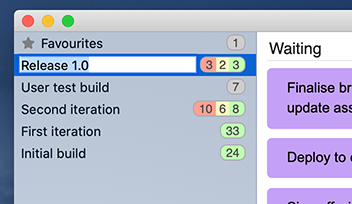 WipQ uses standard macOS interfaces, including the latest document handling with versioning and reversion support, undo/redo, cross document dragging, drag to desktop, various cut/copy formats, printing, full screen, document tabs, macOS 10.14 Mojave dark mode and continuity camera, and export to CSV, XML and JSON (in case you want to move all your data to a different tool). Minimum required macOS version 10.13 High Sierra.